In an experiment with rambling, I’ve started a podcast. The first episode is out. I have James Introcaso on as a guest and we talk about adventure building. It’ll take awhile to get comfortable in front of the mic. But it’s no different than taking the plunge and getting behind the screen for the first time, right? I earn a little more XP each episode and I hope to level up in Bard(Podcasting) in the future. Meantime, catch episode #1 of the Roleplaying Tips podcast here. We played Friday and had a great session. This report will be brief because the whole night amounted to a running combat. Which is ironic, because as I was drawing the map for the first encounter I said I’d try out my new whiteboard and only draw individual areas on it. I thought all encounters would be independent and we wouldn’t need a progression map. Turns out we needed a progression map. The Hobos had descended deep into the earth in S2 Episode#10. They discovered an ancient dwarven redoubt and managed to find a secret entrance only slightly less perilous than the front gates. Entering the door, the group finds a sumptuously decorated private chamber. And beside it, a chamber brimming with eight plate mailed cult guards, a bulette and rider, and two shadow demons. No parley is attempted. Combat erupts. After that fight, the Hobos chase fleeing foes and begin another big battle with a giant stone golem, eight sacred stone monks (who like back flips and yelling “whoop! whoop!” as they attack) and a cult priest. Then it’s a retreat for an attempted short rest. Pitons pounded into rock floors to seal stone door entrances. A guard posted. Eyelids begin to shut. Then a bulette smashes down a door and escaped foes return with reinforcements. More mayhem. For the past hour the entire complex has been rocked by fireballs, stinking clouds, shattering booms, earthquakes, and earth eruptions. Critical hits and grave mistakes rack up the body count. But the stoic earth cultists remain dauntless. Finally, the last wave ends. But not without loss for the party. Malcor goes down late in the fight and cultists whisk him away. Hobos try to web them, then attempt pursuit. But they are barely able to stand, much less trigger another round with monsters and evil cult members. So we end the session there, with Maclor’s fate unknown, and the Murder Hobos attempting to rest again to regain their strength so they can rescue their companion. Hi, this is Johnn here. In today’s newsletter, RPG Designer James Gauvreau kicks off a short series on culture building for you. As a bit of background, James ran a Kickstarter last year and one of his backer tiers was to build a custom culture. I emailed him and asked if he’d build one for Roleplaying Tips readers so we could all see how he dies it. James said sure, no problem. His Kickstarter funded. He asked what kind of culture he should build. So in a recent RPT I asked you to vote for race and terrain to help guide James’ culture creation. Votes were close between several options, so I let James make the final decision. Today I present you with the Klok’k’ot (I’m pronouncing it as cloak-cot). They are a human culture of desert city dwellers. James covers a little about the culture and a little about his process. I hope this helps with your world-building. Oh, and after chatting, James and I have decided to release The Klok’k’ot as a Creative Commons Attribution-ShareAlike 4.0 International License. That means you can use the Klok’k’ot articles free for your campaigns and change whatever you like. You can put it on your blog or social space. You can also use the content for commercial purposes. Just include a link back to roleplayingtips.com and the Creative Commons license please. The first thing I’ve done is taken Patricia C. Wrede’s Worldbuilding Questions and copied down the headings and subheadings. I haven’t actually looked at the questions at this point, but as I begin to spin ideas and take notes I’m going to organize them according to these sections. Later on in the process some sections got merged and others divided, but if you look at her Worldbuilding Questions and then at this then you should be able to see the skeleton. Example: These are going to be lizardpeople living in Arctic conditions. Also, I already know there used to be an empire of giants, so I need to decide how the culture was affected by their enslavement for centuries, and how they currently think of the undead lich-giants that yet remain. Example: Lizardpeople will shed their skins, so there should be a lot of rebirth symbolism going on, rites of passage, etc. Why not have them make clothing out of their shed skin, too? This will also affect their mythology. Figure out which cultures I’m going to draw on, at least starting out. Having good sources on specific cultures, anthropology, and so on is helpful. Research those cultures and copy down anything that sounds neat, putting them into rough categories. Probably the most important thing to do with cultures is to discard whatever you don’t like. The point is not to create a tribe of Inuit Lizardpeople, but to use the Inuit as a launching pad. Looking at multiple cultures in the same environment that these people live in, especially if those cultures are separated by time or space, will be helpful in figuring out what’s more or less unique to a particular culture (which you should put in only if you really like it and it doesn’t detract) and what seems to be universal among them (which you should almost always include, because such things tend to be an inevitable result of living in that environment). Between my initial ideas and what I’ve found in my research, start putting things together. Expand descriptions, work out implications, and occasionally prune things away as they seem to not fit. At least for me, at this point completely off-the-wall ideas are going to start pouring out. Check them for consistency with the core concept, and then expand, work out implications, and prune. This civilization is a collection of city-states in what was once a fertile region but is undergoing desertification. They’re holding on by tapping into underground reservoirs, but this is going to run out and the leaders, at least, know that. This culture will be able to serve a variety of purposes. At their present stage of decline, how they work as an urban civilization in the desert is actually explicable. Later on, they provide the base for a network of ghost cities being devoured by the sands (for those of you who want a little bit of history behind your dungeons) or a shared cultural heritage for regional civilizations, both sedentary and nomadic. They can serve as allies, quest-givers who need the PCs to help solve their problem, or morally ambiguous foes whose war has been launched out of desperation rather than active malice. Before we go further, though, they need a name. For a culture that you’re going to use in a game (rather than a novel), you don’t need to go overboard with the language. What I did with some of my cultures was to mess around with words in a certain language. The Ko Netko were based on lojban, and from that I got words like “ginket” and “tednot” (but that was almost five years ago, so don’t ask me how!). Other times, I simply bounced around nonsense words until something took shape. In both cases, I’d make words on the fly but then, once I had a nice pool, I would try to work in some shared elements between words to make them seem more like a cohesive whole. A strategy I’m trying now is using online language generators. There are a lot of these, with more or less work for each one. What I’m going to be using today is the Language Mixer on Chaotic Shiny. So long as you don’t have more than ten or eleven different new cultures in your campaign, this should work out fine (and if you do, then before you start looking at more complicated language generators you might want to start thinking about which cultures might have shared roots, and derive one language from another). It might be a little cliché, but I decided to go with the “Harsh” variants. I’m going to use “thecities” (no space) as my base, since that’s believed to be the meaning of “Garamantes,” and plug it into each of the three Harsh languages to see which one I like. It’s been a long time since I’ve done anything with apostrophes, and I like the sound of it, so I’m going to use Harsh 2 for this culture, giving me the name “Klok’k’ot.” For the singular form, I’ll input “thecity.” This gives me “Klok’kv,” but I don’t know how you’d pronounce “kv” so let’s set a rule that “kv” will always be changed to “ke.” These people are now called the Klok’k’ot, and an individual is called a Klok’ke. The Klok’k’ot trace their origins to a great nation of cattle herders and date farmers. In days of old they were divided into eight tribes, alternately warring and trading with each other. Eventually, however, the tribes of the Klok’k’ot were unified by a great leader, who is said to have set down firm boundaries between the territories of each tribe and taught them architecture, mass governance, and other arts necessary to the building up and maintaining of cities. In the heart of each tribe’s territory a city was erected, named after that tribe: Aro Kavr, Kea Kavr, Kloo Kavr, Gayu Kavr, Gako Kavr, Tizi Kavr, Tokor Kavr, and O’selk Kavr. Design note: Each of these means “City of the [tribe]” O’selk Kavr translates to “City of the O’selk.” There’s no real reason why “city” was put at the end. Just remember that not every language orders sentences and names in the same way. In fact, some languages shift the word, giving or removing suffixes or making other changes, depending on its relation to other elements of the statement. This means you could have names like Aro Kavr and Tizi Kavu next to each other. Perhaps the Klok’k’ot also have a gendered language. In the time following, they almost exterminated the rival Dsurrunirrda, eventually hunting them down from chariots. Today, the Dsurrunirrda are nearly a vanished people, and few Klok’k’ot know enough of history to connect the cave-dwelling Kuasrabko, as they are called, to their prouder ancestors. However, this campaign was probably essential to the formation of a shared identity. Nothing builds team spirit like going to war against your neighbors (and increasing their territory made it easier to end squabbles over land, too). Though politically and socially close to each other, the cities of the Klok’k’ot were (and are) still mostly independent from each other, and the people of each city were more egalitarian than not. As they grew prosperous in what was a bountiful land of many tall trees, they grew prosperous together. However, to pay proper thanks to the gods for this prosperity, they began to build increasingly elaborate temples. Between the construction of these temples, the exporting of timber, and the clearing of land for agricultural purposes, there was much deforestation. Exacerbating this, their cattle were allowed to overgraze the land. All this resulted in erosion of the fertile topsoil and, too quickly, the beginning stages of desertification. As has happened before, the process began slowly enough that, by the time it was realized to be a manmade phenomenon, there was little the Klok’k’ot could do about it. 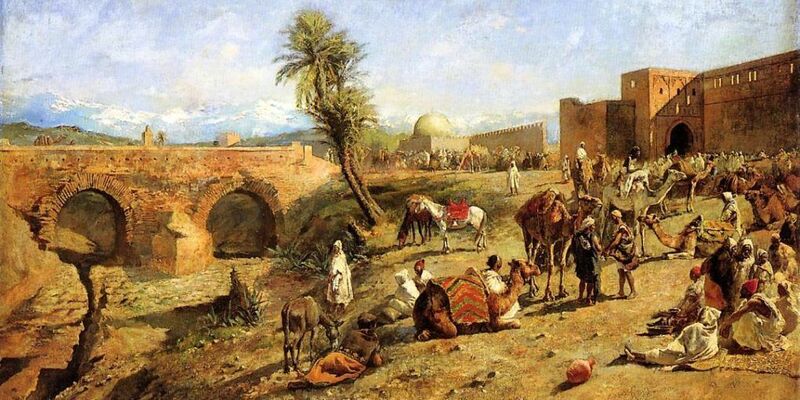 Their decline, and the development of the region first into a Dust Bowl-like environment and then something closer to the Sahara Desert, has been going on for close to four hundred years. Over this time, they have become more self-contained, decreasing trade in some respects and shifting it in others, and limiting their interaction with many outside communities. Innovation has been promoted, necessity being the mother of invention, and they have developed new irrigation techniques and introduced soil and water control features like terraces and check dams, though all these things have only slowed the inevitable. Outlying settlements and fields have been abandoned due to aridity and other adverse conditions, with some heading inward. Others who suspect things are just going to get worse, leave altogether. Centralized power structures have developed, and are struggling to retain control over dissolving settlements and keep secret the fact their stores of water are all too finite. Today, the biggest of their cities — Kea Kavr — has four thousand people, with six thousand more in the surrounding villages. If we assume an average of half this in each of the other territories, that comes to 45,000 people. This isn’t bad for a dying civilization living off of fossil water, but you can adjust it up or down according to the needs of your campaign, where they are in the timeline of their decline, and the efficacy of magic in your setting. Design note: The Klok’k’ot are probably found in an equatorial area. It would be easy, considering their history is partially based on the desiccation of the Sahara, to say they are located in such an area. But as we see from history there are other regions in the world where ancient civilizations would have been able to have such an effect. Potentially, they could even have coastal cities yet still be in a bind because they don’t have the ability to desalinate the water, but there might be some ancient (if inefficient) method of desalinating water, so I will let you do that instead of me. The majority of Klok’k’ot are farmers, merchants, and craftspeople. There is not much engagement in warfare or construction works anymore, with the sole exception of religious buildings (which are now usually built smaller). Men generally dominate in the political sphere and at home, but women have noteworthy influence through being the more literate of the two sexes, and for both demographic and superstitious reasons they dominate those occupations that require writing. The Klok’k’ot did not create their own writing system, but received it about fifteen hundred years ago from the matriarchal Buruk-uk. In the process they also received a few ideas about who was allowed to write, without exactly changing their already-existing ideas about gender roles. It was believed (perhaps through the direct or indirect influence of the Buruk-uk, though no Klok’ke knows and the Buruk-uk are now extinct) that writing was a form of magic, and only women could safely handle it in all of its manifestations. Men might be able to write a little bit, but there are words unsafe for a man who knows how to decipher, which could kill him or drive him to madness. As the Klok’k’ot became better acquainted with the rest of the world and found a different order of things, it was believed their system of writing was somehow different and more potent than the other scripts of the world, which both preserved the superstition and discouraged them from adopting another, weaker writing system. As an example of the importance of writing systems, the Klok’k’ot believe that history can literally be rewritten by malevolent sorcerers, and the only defense against this is to maintain a record of that history. Whatever is not written down can be changed very easily, and one’s choice of script and language will determine the power of the protection that is granted by that record. The people are most active in the morning and the evening, when there is light enough to see by but the sun has not made things too hot. There is additional hustle and bustle on full moon nights, when there is enough light to see by for at least some activities. Like many preindustrial people, the Klok’k’ot naturally wake up for a couple of hours in the middle of the night, and on full moon nights they go out to converse with the neighbors (whereas on darker nights, they stay indoors). Most people live with their cousins and grandparents, and whole groups of houses are inhabited by relatives sharing a common ancestor two or three generations past the grandparents. Feasting and communal eating in general are important parts of cultivating a proper spirit of community, and a holdover from the days before the cities were founded. Each kind of food is put in a different dish — usually a clay vessel of some sort — and is passed around the group. One vessel comes, a little bit of it is taken, and then it is passed on. If the next person is already occupied with something (as will happen, depending on the ratio of dishes to people) then it is permissible to set the dish down in front of that person. The Klok’k’ot usually eat on the floor, sitting in a circle around a low eating surface, like a table without legs. A recent innovation is a kind of table made of multiple parts, which is able to rotate, but it is only slowly being accepted — most people believe the act of handing a dish to another person is very important. It is considered important to not exclude people from a meal. If a member of the household is too sick to eat with the rest of the household, the group will move its usual place of eating to wherever the invalid relative is. While some will ignore this rule if the sick person is usually unconscious, others consider it permissible to eat while someone is sleeping if the circumstances are right and they are at least in that person’s presence. If not, then sickness heralds intermittent fasting for the healthy members of the household (who may not be healthy for much longer, depending on how contagious the disease is). Hospitality customs overlap with this practice. It goes so far that, in war, some Klok’k’ot have invited soldiers from the enemy camp to eat with them, never mind that they would be killing each other the next day. As the desiccation of the land continued, a curious tradition arose regarding the blood of the dead. Upon someone’s death, the corpse is strung up by its feet and hands and left to hang for several hours. After the blood has pooled, the corpse is sliced open and the blood is collected in a pot. It is then poured into a pan, where it will be boiled and stirred constantly by an attendant. After it has been boiled for some time and most of the moisture has been removed, it is poured out onto a thin slab of clay, a prepared floor, or other surface. The blood will be left to dry in the sun or (more rarely) be put into an oven and baked. Any chunks will be ground up, and the final product will be spread over the fields. This is conceptualized as the return of the dead person’s water to the community (through the crops they will eat), but it is also good agricultural practice — blood meal, as it is called on Earth, is an incredible source of nitrogen. It also deters most herbivorous animals, especially the more skittish ones, and can turn yellowing plants green again. R. James Gauvreau mostly just builds worlds, and will often only write a story so he has an excuse to build the world it’s set in. He maintains a blog at whitemarbleblock.blogspot.com, where he regularly posts fiction, story ideas, worlds, and anything else that strikes his fancy. 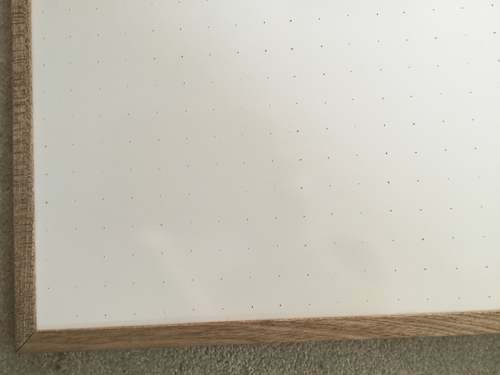 Recently I asked readers for suggestions on how to add a grid to my new whiteboards. 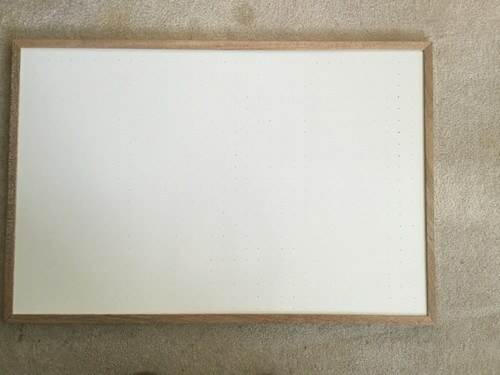 I grabbed some cheap 3’x2′ whiteboards from Staples with nice wooden frames on them. Perfect for laying on the table and mapping. Lots of ideas came in, but in the end I chose probably the most time consuming yet effective method for my circumstances. Use artist tip or other thin tape. This would have been awesome and fast, but would have also impeded drawing with dry erase markers. Also, I’ve seen boards done this way and the tape was peeling or sliding away, leaving gunge behind. Use a T-Square and utility knife to cut the grid. Awesome idea. This was my back-up plan. But I wanted to try a different method that would leave more board clear from cuts to save wearing of marker nibs. I know, I’m being picky here. Use chalk lines and mark a grid, then cut or drill. Also a great idea. My back-up-back-up plan. I wanted to try a less messy option. Use a Sharpie or permanent pen. Dry erase markers lift permanent ink off boards, as does board cleaning after awhile. Use a ruler or cardboard guide to draw or cut lines. I tried this initially. The dang guide kept sliding around and my lines became crooked. I erased and went back to the drawing board, ba dum bum. So here’s where I landed. 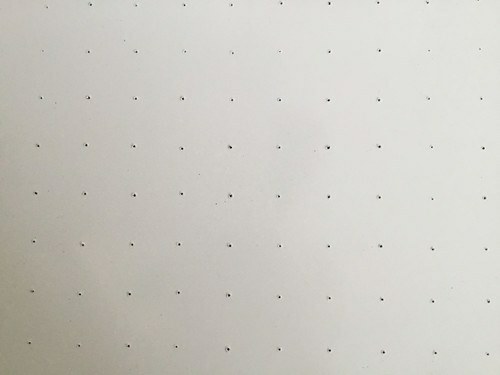 I printed out 1″ square graph paper, trimmed the edges, and taped it on my board. This took a long time. I did a few rows each day and I was done in a few days. The only problem is I drilled the marks with different weights. This made some holes bigger and deeper. No effect on gameplay, but aesthetically not 100%. I’ll try to be more consistent with the next board. 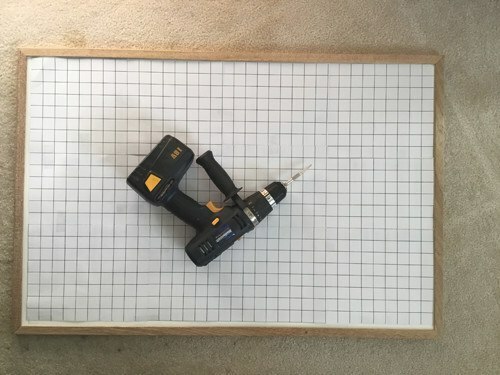 So, if you like lots of drilling and some fiddling with graph paper, you might enjoy this solution. Otherwise, try one of the ideas from your fellow readers above. Just thought I’d pass on this useful link I came across during an in-game discussion my group had about the size and weight of your average boulder. The weight of something relatively so small was pretty amazing. Have fun and keep the tips coming! One of my favourite props is an old cloth map from an RPG computer game. Now I find you can make your own. These come in different sizes, from 14 to 22 inches square. Cloth maps are easy to transport and use, and at the largest size, you could use them for battlemaps with minis. If you are like me, you are not a great actor and accents aren’t your forte, either. But I discovered this one simple trick to portray any NPC quickly and easily: Do an impression. Pick an actor, celebrity, politician, or a character from a TV show or movie, and do your best impression of them. By having a single, real person to focus on, it will make your portrayal much more consistent. But the key rule is: never tell your players who you are imitating. If you do, they will judge your impression and find it lacking. 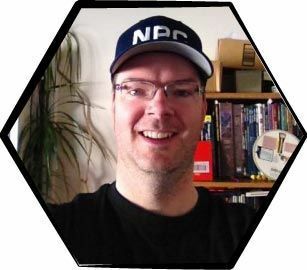 Instead, the players will associate your portrayal with that particular NPC, and no-one else – certainly no-one from real life! For example, you might decide to portray the Dwarf King as an aged Scotsman. But that accent can be hard for some people, who wind up waffling between vaguely-military-sounding and drunken pirate. Instead, you might focus on doing a Sean Connery impression. Now instead of attempting some generic accent meant to cover an entire nation of people, you only have to mimic one person. Your players don’t need to know that the Dwarf King is “supposed” to sound like anything or anyone in particular. To them, the Dwarf King just sounds like the Dwarf King. Remember the R.E.Howard Conan story Red Nail? How about having an active war going on between factions in a dungeon complex. Even between several factions, tribes, or affiliations. It would keep things really active and fluid with strikes, counter-strikes, raids, scouting missions, and defensive patrols/sweeps. Drop the party into this mix and you have a recipe for chaos, anarchy, and fun. Not only would you have combat situations, but role-playing opportunities, trap filled areas (some that appear suddenly as one faction or another tries to pre-empt enemy movement into or through a previously non-trapped area), and other non-aligned monsters that try to remain neutral and avoid the fray (or are mutually opposed to all the parties involved and prey on all sides). One or more of the many factions could even be another adventuring team trying to explore and loot the complex, as well. Done right this could really be a roller-coaster ride of a mega-dungeon. Thanks to the Roleplaying Tips Patrons who help make this newsletter free to you. Patrons like Rob Donoghue, Anthony Chiesi, Rob Abrazado, Jonathon Dyer.